Baked goods are an essential part of British culture with both sweet and savoury delights delicately gracing our fine china all over the country for hundreds of years. Living in Great Britain in the middle ages, sweeteners such as sugar were very hard to obtain. Carrots used to be widely used as a sugar substitute because of their natural sweetness. Carrot cake recipes date back to the mid 16th century however, the first actual carrot cake recipe wasn’t introduced to Britain until the late 1800’s. Why not Liven up the humble carrot cake by introducing St. Dalfour Thick Cut Orange Preserve to the mix. This naturally tangy spread will complement the sweetness of the carrot perfectly. Wrapping meat in pastry is nothing new and has been traced right back to ancient Roman times. However, sausage meat wrapped in pastry, known as Sausage Rolls, was first created in the early 19th century. Its famous flaked pastry can be attributed to French cuisine, therefore, making sausage rolls the notoriously messy treat they are today. With a great rise in the number of vegetarians, alternative meat products are widely eaten now more than ever. So why not try our Apricot and Walnut vegetarian sausage rolls. Pain au Chocolate is believed to have been imagined after Marie-Antoinette introduced the Croissant to France in the 18th century. However, the Pain au Chocolate is a new invention in comparison. 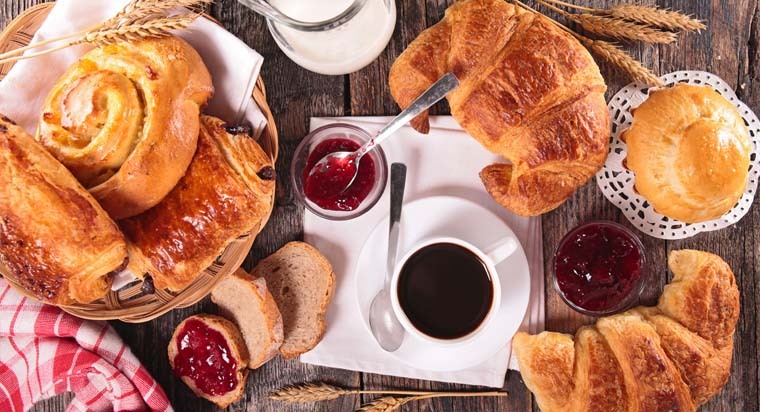 It is believed the French adapted the Croissant recipe to accompany a chocolate filling the late 1800s, which gives us the product we know today. To add a fruity twist to this French favourite, why not include a tablespoon of our St. Dalfour Raspberry Preserve. It goes fantastic with chocolate, or even as a deliciously fruity substitute. Make sure to share your traditional twists on our Facebook and Twitter page. Who knows, you might create the next Great British favourite.